INDIAN WELLS -- It couldn't happen again. A Williams sister withdrew shortly before her semifinal in the BNP Paribas Open. Serena Williams, who had boycotted the tournament for 14 years, pulled out of tonight's match against Simona Halep with inflammation and pain in her right knee. Halep, seeded third, will meet resurgent Jelena Jankovic, seeded 18th, in Sunday's final. Jankovic, a former world No. 1 and the 2010 BNP champion, beat 24th-seeded Sabine Lisicki 3-6, 6-3, 6-2. Halep, 23, is 3-1 against Jankovic, 30, with three straight wins. In addition, Jankovic is recovering from a torn leg muscle. Earlier today, sixth-seeded Milos Raonic saved three match points in a 4-6, 7-6 (10), 7-5 victory over third-seeded Rafael Nadal, a three-time BNP champion, in the quarterfinals. That prevented the first "Big Four" semifinals since the 2012 Australian Open. 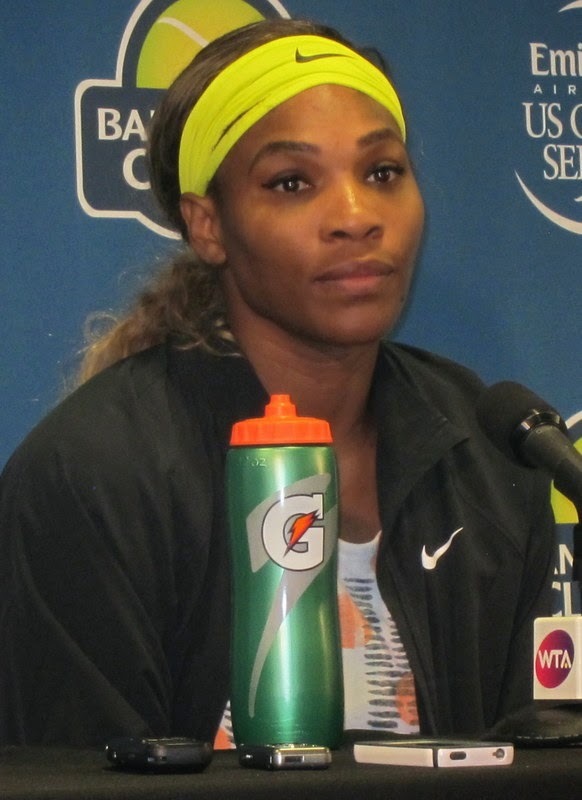 Williams' withdrawal was the third premature exit in the BNP Paribas Open in two days. On Thursday, qualifier Lesia Tsurenko of Ukraine retired with an ankle injury with Jankovic leading 6-1, 4-1, and 32nd-seeded Bernard Tomic of Australia pulled out of his quarterfinal against top-ranked Novak Djokovic with a back problem and infected wisdom tooth. Williams, 33, said she felt pain in practice two days ago and received an injection before her scheduled match, but it didn't help. "I have never done an injection before," a cordial, upbeat Williams told reporters. "I think if this was any other event, I probably wouldn't have considered it. I wanted to give 200 percent. It just wasn't meant to be this year." Williams rated her pain level as "9 or 10" on a scale of 1 to 10 but said she needed only two days to recover. She added that she hasn't decided whether to defend her title in Miami, which begins next week. Williams addressed the fans in Stadium 1 about her injury and received mostly cheers and a few hoots. It was almost as if Williams was testing the crowd after the 1991 controversy. That year, Venus Williams withdrew 20 minutes before her scheduled semifinal against Serena with knee tendinitis. Fans were upset that they got a doubles match instead, and some suspected that Richard Williams had orchestrated the withdrawal so his daughters wouldn't have to play each other. Also, Richard Williams said fans directed racial comments at him. Serena, then 19, was booed loudly throughout the final against Kim Clijsters but won her second title in the tournament. Venus still hasn't returned to the BNP Paribas Open. The Serena-Halep semifinal was supposed to be the second match of the night session, following Jankovic-Lisicki. But because the afternoon match between Raonic and Nadal lasted almost three hours, the night session actually kicked off with a men's doubles semifinal. Williams-Halep was not replaced with another match or exhibition. Serena said she did not fear talking to the crowd. "I think both myself and the crowd have a great appreciation for each other, and I have really enjoyed my four matches here," she said. Regarding the irony of both sisters withdrawing from semifinals in the tournament, Williams said: "I don't make anything of it. I feel that was 14 years ago, and this is now. I did the best that I could at this event, and I really am happy to have put a lot of that behind me." When asked whether she will return next year, Williams said, "I think it's going to be a must." Raonic needed 2 hours and 58 minutes to subdue the valiant Nadal for the first time. Raonic had been 0-5 against the Spanish star, although the last meeting, in the quarters at Miami last year, went to 6-4 in the third set. Nadal won the first four encounters in straight sets. In Saturday's semis, the sixth-seeded Raonic will face No. 2 Roger Federer, and No. 1 Novak Djokovic will play No. 4 Andy Murray. Federer, who owns a record four Indian Wells titles, dismantled No. 9 Tomas Berdych 6-4, 6-0. Djokovic and Murray advanced on Thursday. Federer is 8-1 against Raonic. But, just as against Nadal, Raonic extended the victorious Federer to 6-4 in the third set in their last encounter. That occurred in the Brisbane final in January. Djokovic leads Murray 16-8, including a four-set victory in the Australian Open final in January. Murray, a two-time Grand Slam singles champion, is still returning to form after undergoing "minor" back surgery in September 2013. With Nadal standing practically in the next country to return serve on many points, the 6-foot-5 (1.96-meter) Raonic blasted 19 aces at up to 147 mph (236.6 kph) and saved six of the seven break points he faced. He was broken for the only time in the tournament to trail 2-1 in the first set. All of the match points against Raonic came on his serve in the second-set tiebreaker. He converted his first serve on the initial two match points, winning on a forehand approach and an overhead. There wasn't much Nadal could do about either. The third match point, at 10-9, was another story. Raonic missed his first serve and hit -- by his standards -- a powder-puff second delivery at 101 mph (162.5 kph). Nadal mis-hit the return into the net with a forehand. "That was a big mistake," conceded Nadal, 28. "That's the only (regret) during the whole match." The left-handed Nadal missed three months last summer with a right wrist injury and underwent an appendectomy in November. He ended a nine-month title drought in Buenos Aires on clay three weeks ago. "Maybe with more victories on my shoulders, (after) being outside of the competition for several months, maybe I will win that match because I will not play a return like this," Nadal said. "But is normal that you are a little bit more nervous in that moment than usual. It's true that I didn't compete at that level of intensity for a long time. This is a big improvement for me. I was very focused, playing with positive energy for three hours." Raonic broke Nadal for the only time in the match for 6-5 in the third set on a floater that landed just inside the baseline. By the time Nadal retreated to the ball, he could only flick a backhand long. Raonic then served out the match. He showed little emotion during the battle or afterward. "That's just the way I am," said the 24-year-old Canadian, widely considered as a potential Grand Slam champion. "It's really great what I was able to do today, and I'm very happy with it, but I don't let myself get caught up, because this isn't where it ends. There is a lot more that I want to achieve this week. "It's always about what I need to do next to get better. It's always been like that." Raonic took some pleasure in ending talk of a "Big Four" semifinals. "I guess (it's nice), because you want to prove people wrong in that sense," said Raonic, who won the last four SAP Open titles (2011-13) in San Jose before the tournament folded. "But I can't control what people say. I just try to get in my own system, in my own bubble, and focus on things that I do have control over." Pennetta in the quarterfinals at Indian Wells. INDIAN WELLS -- Sabine Lisicki and Flavia Pennetta seemed like unlikely candidates to produce a classic today in the quarterfinals of the BNP Paribas Open. Sure, Lisicki reached the 2013 Wimbledon final at 23 years old, losing to Marion Bartoli. And, yes, Pennetta won last year's BNP for the biggest title of her career. But this was their first career meeting, Lisicki was 1-6 this year entering the BNP, and she hadn't won a match in the tournament in seven years. Meanwhile, Pennetta had broken down in tears during her three-set victory over second-seeded Maria Sharapova in the previous round. Still, Lisicki and Pennetta played the match of the tournament, with Lisicki prevailing 6-4, 6-7 (3), 7-6 (4) in 2 hours, 40 minutes. Pennetta saved a match point serving at 4-5 in the second set, and Lisicki survived three match points on her serve at 4-5 in the third set. "It was great to be part of a match like that," gushed Lisicki, a German seeded 24th. Pennetta, a 33-year-old Italian, expressed mixed feelings afterward. "I think it was a really good match," said the 15th seed. "We played really well the third set both, and was a good fight until the last point. Everything happened tonight. Match point for one, match points for the other one. "Sport is like this. Tennis is like this. I'm happy about the match, but of course I am upset, because when you are there, you want to win it." Pennetta showed no signs of the emotional turmoil that overwhelmed her after the first set of her 3-6, 6-3, 6-2 win over Sharapova, a two-time Indian Wells champion. "In that match, I just pass the point where you have to (let) everything out," said Pennetta, who never specified what troubled her. "Today, I was perfect in the court and ready to do the match and ready to fight, and I think I did that." The match in 16,100-seat Stadium 1 began slowly with numerous errors and service breaks, but it picked up dramatically when Pennetta served 4-5 in the second set. From then on, the players engaged in many breathtaking rallies featuring laser groundstrokes. On match point against Pennetta, she missed her first serve. Lisicki pounced on the second delivery, but Pennetta kept the ball in play and won the point with a forehand passing shot down the line after a tremendous rally. The crowd grew in the third set as the afternoon match extended into the night session. When Lisicki ripped a forehand cross-court passing shot after making several incredible gets, the fans gave her a standing ovation. "It's always great to play in front of a full crowd," Lisicki said. "That's what I play for. That's the best thing that can happen." Lisicki, who set the record for the fastest women's serve (131 mph or 210.8 kph) in the Bank of the West Classic at Stanford last summer, escaped the match points against her with a 117-mph (188.3-kph) service winner down the middle, a forehand cross-court passing shot set up by a strong serve, and a 111-mph (178.6-kph) service winner down the middle. "I just stepped up to the line and believed in my serve," Lisicki said of the three points. After Lisicki aced Pennetta with a slice out wide to end the thriller, she dropped to her knees and put her head in her hands. And after embracing Pennetta at the net and shaking hands with the chair umpire, Lisicki again put her head in her hands. Who could blame her, especially the way her year had gone? "I had a tough start to the season losing three close three-setters in a row," Lisicki said. "Even my preseason was good, and we had a feeling we were doing the right things off the court, working hard. "Somehow, it didn't pay off yet, but we kept working. I have a great team behind me. They kept telling me that I'm doing the right things and that they believed it will pay off. It's nice to see that it's starting to pay off finally." Lisicki will face 18th-seeded Jelena Jankovic of Serbia in Friday night's first semifinal. Top-ranked Serena Williams, returning to the tournament after a 14-year boycott, then will meet No. 3 Simona Halep of Romania. Jankovic, a former world No. 1 who won the BNP title in 2010, defeated qualifier Lesia Tsurenko of Ukraine 6-1, 4-1, retired (ankle). Tsurenko had beaten three seeds in a row, including seventh-ranked Eugenie Bouchard and No. 10 Andrea Petkovic for the first top-10 wins of her career. On the men's side, half of a potential "Big Four" semifinals is set. Top-ranked Novak Djokovic advanced when 32nd-seeded Bernard Tomic of Australia withdrew with a lower-back injury and infected wisdom tooth. No. 4 Murray improved to 10-0 against No. 12 Feliciano Lopez with a 6-3, 6-4 victory. In Friday afternoon's men's quarterfinals, second-seeded Roger Federer will meet No. 9 Tomas Berdych, and No. 3 Rafael Nadal will take on No. 6 Milos Raonic. In tonight's men's doubles quarterfinals, eighth-seeded Jack Sock of Tampa, Fla., and Vasek Pospisil of Canada ended the two-year reign of top-seeded Bob and Mike Bryan, 6-4, 6-4. It was a rematch of last year's Wimbledon final, also won by Sock and Pospisil. However, they fell to the Bryans one month later in the Cincinnati final. The Bryans will play for the California Dream, Sacramento's new franchise in World TeamTennis, this summer. a forehand in his victory over No. 5 Kei Nishikori. INDIAN WELLS -- Feliciano Lopez is playing the best tennis of his career at the advanced age of 33. The Spaniard, ranked a career-high No. 12, took out No. 5 Kei Nishikori 6-4, 7-6 (2) today to reach the quarterfinals of the BNP Paribas Open for the first time in his 13 appearances. Lopez, a 6-foot-2 (1.88-meter) left-hander, blasted 12 aces in the 95-minute match. Nishikori, the U.S. Open runner-up last September, played in the fourth round of the BNP Paribas Open for the first time. "I had one bad game at 5-4 (in the first set)," the 25-year-old Japanese star lamented. "Until then, I was playing better. He was hitting good serves, but I had all the chances. But just one bad game at 5-4 -- I think that's all that matters in today's match." Lopez will meet fourth-seeded Andy Murray, who lost to Rafael Nadal in the windy 2009 final, in the quarters. The other quarterfinal in the top half of the draw will be No. 1 seed Novak Djokovic against No. 12 Bernard Tomic of Australia. In the bottom half, No. 2 Roger Federer will play No. 9 Tomas Berdych, and No. 3 Nadal will face No. 6 Milos Raonic. Djokovic and Federer eliminated the last remaining U.S. men in singles. Djokovic held off No. 18 John Isner 6-4, 7-6 (5), in the second match of the night session, and Federer dismissed Jack Sock 6-3, 6-2 in 69 minutes in the last match of the day session. Isner defeated Djokovic, 7-6 in the third set, in the 2012 semifinals at Indian Wells before losing to Federer in the final. The 33-year-old Federer, who owns a record four singles titles at Indian Wells, earned his 50th career victory in the tournament today. Still, it was an encouraging tournament for Sock, 22. Playing in his first tournament of the year after undergoing hip surgery in mid-December, he reached the fourth round of an ATP Masters 1000 tournament, the highest level other than the Grand Slams, for the first time. Tomic, also 22, outlasted 18-year-old countryman Thanasi Kokkinakis 6-4, 4-6, 6-4. Kokkinakis was trying to become the eighth teenager (since 1987) to reach the Indian Wells quarterfinals. Four of the others are in the International Tennis Hall of Fame (Boris Becker, Andre Agassi, Michael Chang and Jim Courier), and the other three will be (Nadal, Djokovic and Murray). Meanwhile, top-ranked Serena Williams and third-seeded Simona Halep advanced to a semifinal meeting. Williams defeated 27th-seeded Timea Bacsinszky 7-5, 6-3 to end the Swiss player's winning streak at 15 matches. Halep topped 12th-seeded Carla Suarez Navarro of Spain 5-7, 6-1, 6-1 to moved into the Indian Wells semis for the second straight year. The other two women's semifinalists will be determined on Thursday. No. 15 seed and defending champion Flavia Pennetta, another 33-year-old, of Italy will face No. 24 Sabine Lisicki of Germany. No. 18 Jelena Jankovic, the 2010 champion, will meet qualifier Lesia Tsurenko of Ukraine. INDIAN WELLS -- Wayne Odesnik's career, it appears, is over after a second doping offense. The 29-year-old Floridian was suspended for 15 years after testing positive for several banned substances, including steroids, in December and January, the Tennis Anti-Doping Program and United States Anti-Doping Agency announced today. Odesnik, who won the 2007 Sacramento Challenger at the Sutter Lawn Tennis Club, served a one-year suspension in 2010 for possession of human growth hormone. A 5-foot-11 (1.80-meter) left-hander, Odesnik is ranked No. 267 in the world. He reached a career-high No. 77 in 2009. ''Bye bye Wayne... Good riddance,'' tweeted Andy Murray, a two-time Grand Slam champion. After beating Adrian Mannarino of France 6-3, 6-3 to reach the quarterfinals of the BNP Paribas Open, Murray said, "I think it's good for tennis to get him off the tour because we don't want that being part of the tour." 3-6, 6-3, 6-2 in the fourth round of the BNP Paribas Open. Flavia Pennetta is still going strong at age 33. The No. 15 seed and defending champion from Italy ousted No. 2 seed Maria Sharapova 3-6, 6-3, 6-2 on Tuesday to reach the quarterfinals of the BNP Paribas Open at Indian Wells. Pennetta has beaten Sharapova three consecutive times and leads the head-to-head series 3-2. All five meetings have gone to three sets. Sharapova, 27, has won two of her 34 career singles titles at Indian Wells (2006 and 2013). Meanwhile, qualifier Lesia Tsurenko of Ukraine knocked off a seed for the third straight round, outlasting No. 6 Eugenie Bouchard of Canada 6-7 (5), 7-5, 6-4 after defeating No. 9 Andrea Petkovic and No. 20 Alize Cornet. Pennetta, the highest remaining seed in the bottom half of the draw, will play No. 24 Sabine Lisicki of Germany. Also, Tsurenko will face Serbia's Jelena Jankovic, the 18th seed and 2010 champion. In the top half of the draw, No. 1 seed Serena Williams will meet No. 27 Timea Bacsinszky of Switzerland, and No. 3 Simona Halep of Romania will take on No. 12 Carla Suarez Navarro of Spain. Bacsinszky extended her winning streak to 15 matches, including the titles in Monterrey and Acapulco. On the men's side at Indian Wells, No. 2 seed Roger Federer dismissed Andreas Seppi 6-3, 6-4 in the third round to avenge a loss to the Italian in the same round of the Australian Open in January. Federer, bidding for an unprecedented fifth Indian Wells title, will face unseeded American Jack Sock for the first time in the round of 16. Sock, playing in his first tournament of the year after undergoing hip surgery in mid-December, surprised 15th-seeded Roberto Bautista Agut of Spain 3-6, 6-3, 6-2 to reach the fourth round of a Masters 1000 tournament for the first time. Sock has lost the first set in all three of his matches. At 22, he already has won two Grand Slam titles, mixed doubles in the 2011 U.S. Open with Melanie Oudin and men's doubles at Wimbledon last year with Vasek Pospisil of Canada. In a match that ended at 12:43 a.m. today, top-seeded Bob and Mike Bryan edged Marin Draganja of Croatia and John Peers of Austria 6-7 (8), 6-4 [10-7]. The 36-year-old Bryan twins, who starred at Stanford, will meet eighth-seeded Pospisil and Sock in the quarterfinals in a rematch of last year's Wimbledon final. The Bryans seek their third straight Indian Wells crown in their native Southern California. Sacramento's new World TeamTennis franchise won't have coach Wayne Bryan this season. But California Dream fans shouldn't feel too bad. The team will have Bryan's sons. The Dream acquired Bob and Mike Bryan, the top-ranked men's doubles team in the world, from the San Diego Aviators for financial considerations before Monday's draft. The 36-year-old identical twins and former Stanford stars have won 16 Grand Slam men's doubles titles and 104 on the ATP Tour, both records. WTT did not announce how many of the Dream's 14 regular-season matches the Bryans will play. Marquee players usually do not play full-time. Wayne Bryan, 68, retired in 2013 after guiding the Sacramento Capitals for 12 years and being named Coach of the Year three times (2004-06). David Macpherson, a former Capital and the twins' personal coach, will lead the Dream. He won Coach of the Year honors last season with San Diego in his first year at the helm in WTT. The Capitals announced early in 2014 that they were moving to Las Vegas after 28 years. Instead, WTT terminated the franchise after team owner Deepal Wannakuwatte was arrested on fraud charges related to his medical supply business. He was sentenced to 20 years in prison in November. In Monday's four-round roster draft, California selected, in order, Jarmila Gajdosova of Australia, Anabel Medina Garrigues of Spain, Tennys Sandgren of Wesley Chapel, Fla., and Aisam Qureshi of Pakistan. Gajdosova, a 27-year-old Slovakia native, became an Australian citizen in 2009. She won the 2013 Australian Open mixed doubles title with Aussie Mathew Ebden. Medina Garrigues, 32, and Qureshi, a doubles specialist who turned 35 today, played last year for the Texas Wild, which relocated to Sacramento. Medina Garrigues, the WTT Female Rookie of the Year in 2014, has been ranked as high as third in the world in doubles and 16th in singles. She won the 2008 and 2009 French Open women's doubles titles with countrywoman Virginia Ruano Pascual. Qureshi reached a career-high No. 8 in men's doubles in 2011. In the 2010 U.S. Open, he was the runner-up in men's doubles with Rohan Bopanna of India and in mixed doubles with Kveta Peschke of the Czech Republic. Sandgren, 23, turned pro after reaching the NCAA singles semifinals in 2011 as a sophomore at the University of Tennessee. He has won eight singles and 12 doubles titles in tennis' minor leagues but underwent hip surgery last year and missed more than six months. The Washington Kastles are heavily favored to win a record fifth straight WTT title and sixth in seven years. Playing at least part-time for Washington will be International Tennis Hall of Famer Martina Hingis; future Hall of Famers Serena Williams, Venus Williams and Leander Paes; former top-20 player Sam Querrey, a San Francisco native; and holdover Anastasia Rodionova. Querrey and Rodionova are former Capitals, although at different times. Eugenie Bouchard, the Wimbledon runner-up to Petra Kvitova last year, was drafted first overall by the Boston Lobsters. Joining Bouchard on the Lobsters will be Scott Lipsky, a 33-year-old doubles specialist from Stanford. Former Cardinal Nicole Gibbs, the 2012 and 2013 NCAA singles champion, went in the first round to Austin Aces. WTT's 40th season will begin on July 12 and end on Aug. 2 with the finals. The Dream will play at the Capitals' former home, a temporary stadium in the parking lot at Sunrise Mall in Citrus Heights. BNP Paribas Open -- Fourth-seeded Caroline Wozniacki and fifth-seeded Ana Ivanovic, both former No. 1 players and champions at Indian Wells, exited in the third round. Wozniacki lost to 31st-seeded Belinda Bencic, 18, of Switzerland 6-4, 6-4, and Ivanovic fell to 25th-seeded Caroline Garcia, 21, of France 6-2, 5-7, 6-2. In another matchup of former top-ranked players and titlists at Indian Wells, second-seeded Maria Sharapova outplayed 32nd-seeded Victoria Azarenka 6-4, 6-3. Azarenka is rebounding from a left foot injury that limited her to nine tournaments last year. On the men's side, 32nd-seeded Bernard Tomic eliminated eighth-seeded David Ferrer 7-5, 6-4 in the third round. Tomic will meet fellow Australian Thanasi Kokkinakis, an 18-year-old wild card, in the round of 16. Kokkinakis lost in the first round of qualifying in his Indian Wells debut last year. Futures tournament -- Ninth-seeded Connor Farren defeated Victor Pham 6-2, 6-4 in a clash of San Francisco Bay Area residents to qualify for the $15,000 Bakersfield (Calif.) Tennis Open. Farren, a USC sophomore, lives in Foster City, and Pham, a high school senior, is from Saratoga. Four top-10 seeds -- three women and one man -- lost on Sunday in the BNP Paribas Open at Indian Wells. Ousted in the third round of the women's draw were No. 7 Agnieszka Radwanska of Poland, No. 8 Ekaterina Makarova of Russia and No. 10 Lucie Safarova of the Czech Republic. Falling in the second round on the men's side was No. 7 Stan Wawrinka of Switzerland. Heather Watson of Great Britain upset Radwanska, last year's runner-up to Flavia Pennetta, 6-4, 6-4. Timea Bacsinszky of Switzerland bounced Makarova 3-6, 7-5, 6-4, and Elina Svitolina of Ukraine took out Safarova 7-6 (5), 7-5. Both Watson and Radwanska have had success in the Bank of the West Classic at Stanford. Watson won the 2012 doubles title with Marina Erakovic of New Zealand, and Radwanska reached the 2013 singles final before losing to Dominika Cibulkova. Bacsinszky extended her winning streak to 14 matches, including titles in Monterrey and Acapulco. Robin Haase of the Netherlands surprised Wawrinka 6-3, 3-6, 6-3. Top-ranked Serena Williams, returning to Indian Wells after a 14-year absence, breezed past 28th-seeded Zarina Diyas of Kazakhstan 6-2, 6-0 in 53 minutes. Williams will meet fellow American Sloane Stephens in the round of 16. Williams leads the head-to-head series 2-1, losing in the quarterfinals of the 2013 Australian Open. Second-seeded Roger Federer, meanwhile, set up a rematch with Andreas Seppi after falling to the Italian in the third round of the Australian Open in January. Eleventh-seeded Grigor Dimitrov, 23, of Bulgaria edged Nick Kyrgios, 19, of Australia 7-6 (2), 3-6, 7-6 (4) in 2 hours, 10 minutes in the first meeting between the potential Grand Slam singles champions. Also advancing to the third round were Americans Donald Young, Steve Johnson and Jack Sock. In men's doubles, top-seeded Bob and Mike Bryan outclassed Kevin Anderson of South Africa and Jurgen Melzer of Austria. The 36-year-old Bryan twins, former NCAA doubles from Stanford, seek their third straight Indian Wells title. They grew up a two-hour drive away in Camarillo in the Los Angeles area. ago in the $2,000 Rio del Oro Open in Sacramento. Fourteen-year-old Jenson Brooksby of Sacramento lost to second-seeded Raymond Sarmiento 6-2, 6-3 on Sunday in the second round of qualifying for the $15,000 Bakersfield (Calif.) Tennis Open. Brooksby, who trains under Joseph Gilbert at Arden Hills, won the USTA 12-and-under national title in 2013. Sarmiento completed his college eligibility last year after a decorated career at USC. He earned All-America honors five times (four in singles and one in doubles) and helped the Trojans win three NCAA team championships. Also in Bakersfield, ninth-seeded Connor Farren, a USC sophomore from Foster City in the San Francisco Bay Area, defeated Jeremy Hunter Nicholas 7-6 (7), 6-4. Farren is scheduled to play unseeded Victor Pham, a high school senior from Saratoga in the Bay Area, today for a berth in the main draw. No. 53 San Francisco def. Navy 5-2 in Pebble Beach, Calif. Records: San Francisco 8-4, Navy 13-4. No. 67 UC Davis def. Northern Colorado 7-0 in Davis. Records: UC Davis 12-3, Northern Colorado 4-9. Gonzaga def. Sacramento State 4-3 in Spokane, Wash. Records: Gonzaga 8-3, Sac State 5-8. Nevada def. Pacific 6-1 in Reno, Nev. Records: Nevada 3-7, Pacific 2-13. No. 42 Fresno State def. Idaho 5-2 in Fresno. Records: Fresno State 12-3, Idaho 8-6. No. 75 Sacramento State def. Loyola Marymount 7-0 in Los Angeles. Records: Sac State 9-7, Loyola Marymount 3-10. Marin Cilic, the reigning U.S. Open champion, made his season debut on Saturday against a former top-10 player. Argentina's Juan Monaco, who will turn 31 on March 29, eliminated the 10th-seeded Cilic 6-4, 6-4 in the second round of the BNP Paribas Open at Indian Wells. Cilic received a first-round bye. Cilic, a 6-foot-6 (1.98-meter) right-hander, is recovering from a sore right shoulder. "(The shoulder) is getting there," he told reporters. "I didn't feel completely painless ... just a little rusty." Also losing on Saturday was ninth-seeded Andrea Petkovic. The 27-year-old German fell to qualifier Lesia Tsurenko of Ukraine 6-3, 4-6, 6-4 in the second round after drawing a first-round bye. It's the second straight year that Petkovic has lost to a qualifier in her opening match at Indian Wells. She was ousted by Camila Giorgi of Italy in 2014. Petkovic reached the semifinals of last summer's Bank of the West Classic at Stanford before losing to Serena Williams, who went on to win her third title in the tournament. two weeks ago in Sacramento. Jenson Brooksby, 14, of Sacramento defeated Timothy Roe 6-3, 6-1 on Saturday in the first round of qualifying for the $15,000 Bakersfield (Calif.) Tennis Open. Brooksby, the USTA 12-and-under champion in 2013, will be a big underdog today in the second round. He will face second-seeded Raymond Sarmiento, who completed his eligibility at USC last year. A five-time All-American (four singles and one doubles), he helped the Trojans win three NCAA team championships. Ninth-seeded Connor Farren, a USC sophomore from Foster City in the San Francisco Bay Area, drew a first-round bye in qualifying. He is scheduled to play Jeremy Hunter Nicholas in the second round. No. 9 Cal def. No. 21 Pepperdine 4-3 in Malibu. No. 1 singles: Fifteenth-ranked Lorraine Guillermo (Pepperdine) def. fourth-ranked Maegan Manasse 4-6, 7-6 (4) [10-8]. Clinching match (No. 5): Sixtieth-ranked Karla Popovic def. Christine Maddox 6-1, 6-3. Records: Cal 11-2, Pepperdine 5-4. No. 60 San Jose State def. Pacific 4-3 in Stockton. No. 1 singles: Iveta Masarova (Pacific) def. Sybille Gauvain 6-3, 7-5. Clinching match (No. 4): Julianna Bacelar def. Francis Dean 5-7, 6-1, 7-5. Records: San Jose State 8-5, Pacific 7-5. No. 75 Sacramento State def. San Diego 4-3 in San Diego. No. 1 singles (clinching match): Alina Soltanici (Sac State) def. Marta Stojanovic 6-2, 2-6, 7-6 (1). Records: Sac State 8-7, San Diego 1-6. Santa Clara def. UC Davis 5-2 in Santa Clara. No. 1 singles: Delphine Rouvillois (Santa Clara) def. Layla Sanders 6-3, 6-0. Clinching match (No. 4): Chelby Cooke def. Lani-Rae Green 7-5, 6-3. Sacramento State def. Eastern Washington 6-1 in Cheney, Wash. No. 1 singles: Sean Kolar (Sac State) def. Robert Dula 6-1, 6-2. Clinching match (No. 4): Kasparas Zemaitelis def. Eduardo Martinez 6-1, 6-2. Records: Sac State 5-7 overall, 3-1 Big Sky Conference; Eastern Washington 3-9, 1-4. "one of the proudest moments of my career." Southern California tennis fans had waited 14 years for this moment. Top-ranked Serena Williams returned to the BNP Paribas Open at Indian Wells on Friday night after once vowing never to do so, beating Monica Niculescu of Romania 7-5, 7-5 in the second round. "I feel like the nerves have kind of gone away," Williams, a three-time champion in the Bank of the West Classic at Stanford, told reporters after her ragged performance against the 68th-ranked Niculescu, who sliced every forehand and many backhands. "I'm glad I was able to do this. It definitely feels like one of the biggest and one of the proudest moments of my career." The 33-year-old Williams, who drew a first-round bye, received a warm reception from a sellout crowd of 16,100 in Stadium 1. She was booed there during the 2001 final, in which she beat Kim Clijsters for her second title at Indian Wells. Her sister Venus had withdrawn 20 minutes before their scheduled semifinal with knee tendinitis. Fans may have suspected that their father, Richard, orchestrated the withdrawal so the sisters wouldn't have to play each other. Richard, however, told reporters that the boos were racially motivated. Or fans might have been upset that they had paid handsomely to see an all-Williams semifinal but got doubles instead. During Friday's day session, Sergiy Stakhovsky of Ukraine defeated San Francisco native Sam Querrey 2-6, 6-4, 6-2 in the opening round. Querrey led 6-2, 3-1 against Stakhovsky, who stunned Roger Federer in the second round at Wimbledon in 2013. Jack Sock, making his season debut following hip surgery, outlasted Yen-Hsun Lu of Taiwan 6-7 (4), 6-2, 7-5. In an all-American first-round women's doubles match, wild cards Sloane Stephens and Taylor Townsend edged third seeds and Raquel Kops-Jones of San Jose and Abigail Spears 6-4, 2-6 [10-8]. Kops-Jones, a 32-year-old former NCAA doubles champion from Cal, and Spears were coming off the title in Doha. No. 9 Cal def. No. 65 San Diego State 7-0 in San Diego. Records: Cal 10-2, San Diego State 6-7. No. 42 Fresno State def. No. 60 San Jose State 5-2 in Fresno. Records: Fresno State 11-3 overall, 2-0 Mountain West Conference; San Jose State 7-5, 0-1. No. 53 San Francisco def. Pacific 5-2 in Stockton. Records: San Francisco 7-4 overall, 2-0 West Coast Conference; Pacific 2-12, 0-2. Idaho def. Sacramento State 5-2 in Spokane, Wash. Records: Idaho 9-4 overall, 2-0 Big Sky Conference; Sac State 4-7, 2-1. Everyone except Brett Favre, it seems, is making a comeback in the BNP Paribas Open. Mardy Fish began the parade on Thursday with a 6-4, 4-6, 7-6 (3) loss to fellow American Ryan Harrison in the first round at Indian Wells. Harrison saved two match points serving at 4-5 in the third set against the former part-time Sacramento Capital in World TeamTennis. It was the 33-year-old Fish's first singles match and second overall in more than 18 months. The former world No. 7 battled an irregular heartbeat and severe anxiety during his layoff. Tonight, Serena Williams is scheduled to make her first appearance at Indian Wells since a racially charged incident in 2001. The top seed and two-time champion, who received a bye in the opening round, will face Monica Niculescu of Romania in the second round. Tennis Channel will televise the match at 7 p.m. PDT. Also, Jack Sock (hip surgery) of Tampa, Fla., and reigning U.S. Open champion Marin Cilic (shoulder injury) of Croatia are set to make their season debuts today and Saturday, respectively. Meanwhile, Austrian left-hander Jurgen Melzer, yet another 33-year-old, beat Dennis Novikov, 21, of San Jose 6-4, 6-4 in a first-round matchup of qualifiers. Novikov had knocked off two seeds in qualifying to reach the main draw at Indian Wells for the first time. College result -- Utah State defeated Pacific 4-2 in Stockton. The Tigers (2-11) swept the doubles and won on Court 2 with Miguel Diaz. On Court 1, Dennis Baumgartner outclassed Alex Hamilton 6-3, 6-2 to help the Aggies improve to 14-4. Dennis Novikov of San Jose recorded his second career victory over a top-100 player to earn his first berth in the main draw of the BNP Paribas Open. Novikov, 21, upset Spanish veteran Daniel Gimeno-Traver, seeded fifth in qualifying and ranked 94th, 6-3, 4-6, 7-6 (4) on Wednesday at Indian Wells. It was the second straight win over a qualifying seed for the 6-foot-4 (1.93-meter) Novikov, who has used his booming serve to soar from No. 612 to No. 256 in the past year. He surprised Slovenia's Aljaz Bedene, seeded 13th and ranked 115th, in the first round. The qualifying event at Indian Wells consists of two rounds instead of the usual three. Mackenzie McDonald, a 19-year-old UCLA sophomore from Piedmont in the San Francisco Bay Area, lost to 23rd-seeded Michael Berrer of Germany 6-4, 6-4 in the final round of qualifying. McDonald had beaten Uzbekistan's Farrukh Dustov, seeded seventh and ranked 99th, in the first round for his second career victory over a top-100 player. McDonald stunned then-No. 79 Nicolas Mahut of France in the opening round of qualifying at Cincinnati in 2013. McDonald then ousted Steve Johnson, now ranked 44th, to become the only unranked teenager to qualify for an ATP World Tour Masters 1000 tournament, the highest level for men besides the Grand Slams. Wild card Nicole Gibbs, the 2012 and 2013 NCAA champion from Stanford making her Indian Wells debut, lost to Monica Puig of Puerto Rico 6-3, 7-5 in the first round of the main draw. Modesto product Maria Sanchez, the 2011 Pacific-12 Conference Women's Player of the Year at USC, fell to top-seeded Polona Hercog of Slovenia 6-3, 7-5 on Monday in the opening round of qualifying. Novikov is scheduled to play fellow qualifier Jurgen Melzer, a 33-year-old left-hander from Austria, today in the first round of the main draw. Melzer is ranked No. 86 after climbing to a career-high No. 8 in 2011. He won the Wimbledon men's doubles title with Philipp Petzschner of Germany in 2010 and ascended to a career-high No. 6 in doubles later that year. At 18, Novikov stunned then-No. 86 Jerzy Janowicz of Poland in the first round of the 2012 U.S. Open. Janowicz, 6-foot-8 (2.03 meters), reached the Wimbledon semifinals the following year. Novikov captured the singles and doubles titles in the USTA Boys 18 National Championships in Kalamazoo, Mich., in 2012 to earn wild cards for both main draws in the U.S. Open. He also advanced to the second round in doubles at Flushing Meadows, pairing with Michael Redlicki to knock off U.S. veterans Bobby Reynolds and Michael Russell. Novikov turned pro in 2013 after leading UCLA to the NCAA final as a sophomore. College result -- Led by Deimante Bulatovaite, the No. 75 Sacramento State women coasted to a 6-1 victory over Southern Utah in Gold River, Calif. Playing on Court 1 for the first time, Bulatovaite edged Veronika Rogova 7-6, 3-6 [10-5]. Bulatoviate, a sophomore from Lithuania, replaced Alina Soltanici, who did not play for an undisclosed reason. Sac State, which has won the last 13 Big Sky Conference tournament titles, improved to 7-7 overall and 4-0 in league play. Southern Utah fell to 1-3 and 0-1.
last August in the first round of the U.S. Open. Photo courtesy of USTA. Only 15 years old, CiCi Bellis is closing in on the top 200 in the world. Bellis, a resident of Atherton in the San Francisco Bay Area, rose 29 places to a career-high No. 215 after winning the $25,000 Fresh Start Women's Open in the San Diego suburb of Rancho Santa Fe earlier this month. It was Bellis' third singles title in a professional tournament (all $25,000 events) and first in her home state. Bellis, who will turn 16 next month, said in this month's Tennis magazine that she will turn pro if she cracks the top 100. Otherwise, she would like to attend Stanford, only a 10-minute drive from her home. Bellis became an overnight sensation last August when she stunned 12th-seeded Dominika Cibulkova, the runner-up in the 2014 Australian Open, in the first round of the U.S. Open. Bellis fell in the second round to Kazakhstan's Zarina Diyas, ranked 48th then and 32nd now, in three sets. Collin Altamirano, 19-year-old Sacramentan -- No. 759 in singles (-2). Bradley Klahn, 24-year-old former Stanford star -- No. 205 in singles (-2), No. 150 in doubles (-1). Scott Lipsky, 33-year-old former Stanford star -- No. 35 in doubles (no change), unranked in singles. Mackenzie McDonald, 19-year-old Piedmont resident -- No. 628 in singles (-2), No. 558 in doubles (-3). Dennis Novikov, 21-year-old San Jose resident -- No. 256 in singles (-3), No. 299 in doubles (-1). Sam Querrey, 27-year-old San Francisco native and former Sacramento Capital in World TeamTennis (2012-13) -- No. 43 in singles (no change), No. 64 in doubles (no change). Matt Seeberger, 30-year-old Los Altos resident -- No. 398 in doubles (-3). Dmitry Tursunov, 32-year-old resident of Folsom in Sacramento area -- No. 151 in singles (no change), No. 250 in doubles (-3). Kristie Ahn, 22-year-old former Stanford star -- No. 536 in singles (-2), No. 610 in doubles (-4). 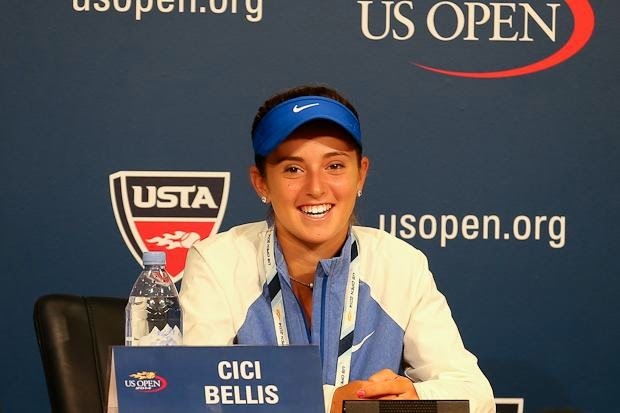 CiCi Bellis, 15-year-old resident of Atherton in San Francisco Bay Area -- Career-high No. 215 in singles (+29), No. 963 in doubles (-5). Alexandra Facey, 22-year-old resident of Cameron Park in Sacramento area -- No. 737 in doubles (-4). Kat Facey, 22-year-old resident of Cameron Park in Sacramento area -- No. 737 in doubles (-4). Nicole Gibbs, 22-year-old former Stanford star -- No. 87 in singles (-3), No. 997 in doubles (-4). Michaela Gordon, 15-year-old resident of Saratoga in San Francisco Bay Area -- No. 754 in singles (-5). Lejla Hodzic, 29-year-old former Stanford standout -- No. 750 in doubles (-4). Raquel Kops-Jones, 32-year-old San Jose resident and former Cal star -- Career-high No. 10 in doubles (no change), No. 795 in singles (-7). Maria Sanchez, 25-year-old Modesto product -- No. 110 in doubles (-1), No. 206 in singles (+14). Karina Vyrlan, 16-year-old Sacramentan -- No. 956 in singles (-5). Allie Will, 23-year-old native of San Mateo in San Francisco Bay Area -- No. 180 in doubles (-3), No. 567 in singles (-3). Carol Zhao, 19-year-old Stanford sophomore -- No. 291 in singles (-2), No. 513 in doubles (+4). Indian Wells, first round (women), 11 a.m.-11 p.m. (live). Indian Wells, first round (men), 11 a.m.-11 p.m. (live). Indian Wells, first and second rounds (men, women), 11 a.m.-11 p.m. (live). Indian Wells, second round (men, women), 11 a.m.-11 p.m. (live). Indian Wells, second and third rounds (men, women), 11 a.m.-11 p.m. (live). Monday -- World TeamTennis draft (marquee and roster players). April 18-19 -- Fed Cup semifinals, World Group playoffs, www.fedcup.com. Despite overwhelming two Pacific-12 Conference opponents, the Stanford women dropped out of the top 10 in this week's college rankings. The Cardinal (9-2, 2-0) fell from No. 10 to No. 12 after dominating Utah 7-0 and then-No. 47 Colorado 6-1 at Stanford. The Cal women (9-2, 2-0) also slipped two notches to No. 9 after blanking Colorado and Utah 7-0 in Berkeley. Defending national champion UCLA jumped from No. 12 to No. 2 after defeating then-No. 3 USC and then-No. 4 Baylor last week. Alabama improved from No. 9 to No. 6 after beating then-No. 6 Georgia in Tuscaloosa, Ala. The San Francisco women (7-4) upset No. 38 BYU in San Francisco to soar 33 spots to No. 39, the biggest jump by any team (men or women). Stanford's Carol Zhao rose one spot to No. 3 in the women's singles rankings, and Cal's Maegan Manasse fell two places to No. 4. Virginia's Collin Altamirano, a freshman from Sacramento, debuted in the men's singles rankings at No. 70. He knocked off No. 40 Max Tchoutakian of Baylor 6-2, 6-2 on Court 3 in Waco, Texas. Altamirano, the USTA boys 18 champion in 2013 and runner-up last year, is 7-0 in singles (1-0 at No. 2, 2-0 at No. 3 and 4-0 at No. 4). In dual matches today, the No. 60 San Jose State women blitzed visiting Southern Utah 7-0, the Liberty women of Lynchburg, Va., defeated No. 71 Pacific 5-2 in Stockton, and the visiting Utah State men topped Fresno State 4-1. For the second straight year, Great Britain defeated the United States in the first round of the Davis Cup. Andy Murray gave his country an insurmountable 3-1 lead with a 7-6 (4), 6-3, 7-6 (4) victory over John Isner on Sunday in Glasgow, Scotland. Murray is from Dunblane, Scotland. In the second reverse singles match, Great Britain's James Ward retired with a sore knee while leading Donald Young 7-5, 0-1. That made the final score 3-2. Bob and Mike Bryan had kept the United States alive with a five-set victory over Dominic Inglot and Jamie Murray, Andy's older brother, on Saturday. Three of the four players in Saturday's match have won an NCAA doubles crown. The Bryan brothers triumphed in 1998 while at Stanford, and Inglot prevailed in 2009 with Virginia teammate Michael Shabaz. Great Britain, seeking its first Davis Cup title since 1936, will host France in the quarterfinals on July 17-19. The United States, which has won a record 32 Davis Cup championships, must win a relegation match in September to remain in the elite World Group. Brett Bacharach and Bryce McKelvie of UC Davis lost to Nicolai Ferrigno Olsen and Lucas Gerch of Oklahoma State 6-3, 6-1 on Sunday in the semifinals of the 126th Annual Pacific Coast Men's Doubles Championship in the San Diego suburb of La Jolla. Ferrigno Olsen and Gerch then beat top-seeded Thibault Forget and Roberto Quiroz of USC 6-3, 6-4 for the title. Forget is the son of former French Davis Cup player and captain Guy Forget, and Quiroz is the nephew of 1990 French Open champion Andres Gomez. No. 70 UC Davis def. Villanova 7-0 in La Jolla. Records: UC Davis 11-3; Villanova 2-7. Sacramento State def. Southern Utah 7-0 in Sacramento. Records: Sac State 4-6, 2-0 Big Sky Conference; Southern Utah 0-1, 0-1. No. 51 Saint Mary's def. Penn 5-2 in Tempe, Ariz. Records: Saint Mary's 6-6; Penn 5-3. No. 62 Fresno State def. Sacramento State 4-3 in Fresno. Records: Fresno State 10-3; Sac State 6-7. No. 73 UC Santa Barbara def. UC Davis 4-3 in Davis. Records: UCSB 6-6, 1-0 Big West Conference; UC Davis 5-9, 3-4. Pacific def. Cal Poly 4-0 in Stockton. Records: Pacific 7-3; Cal Poly 1-8. San Francisco def. Santa Clara 5-2 in San Francisco. Records: USF 6-4, 1-0 West Coast Conference; Santa Clara 2-6, 0-1. Deepal Wannakuwatte will be making a lot of license plates, folding a lot of laundry or doing whatever they do in prison for 20 cents an hour these days. U.S. District Judge Troy Nunley ordered Wannakuwatte to repay $108 million to victims of his massive Ponzi scheme, The Sacramento Bee reported on Saturday. Nunley sentenced Wannakuwatte, the former owner of the now-defunct Sacramento Capitals in World TeamTennis, to 20 years in prison last November. The bill is a bit steep for the 64-year-old Wannakuwatte, who listed assets of about $16 million when he filed for bankruptcy protection last spring, according to The Bee. The Sri Lanka native pleaded guilty to defrauding investors in his West Sacramento medical supply business. The Capitals announced in February last year that they were moving to Las Vegas after 28 years because Sacramento lacks a permanent tennis facility. Shortly after Wannakuwatte's arrest, WTT terminated the franchise. WTT announced last month, however, that the franchise in Irving, Texas, will move to Sacramento beginning this summer and be renamed the California Dream. Davis Cup -- Former Stanford stars Bob and Mike Bryan kept the United States alive in the first round of the Davis Cup, edging Dominic Inglot and Jamie Murray of Great Britain 6-3, 6-2, 3-6, 6-7 (8), 9-7 in Glasgow, Scotland. The United States trails 2-1 entering today's reverse singles in the best-of-five-match competition. John Isner will face Andy Murray, Jamie's younger brother, in the first match, and Donald Young will play James Ward in the finale.